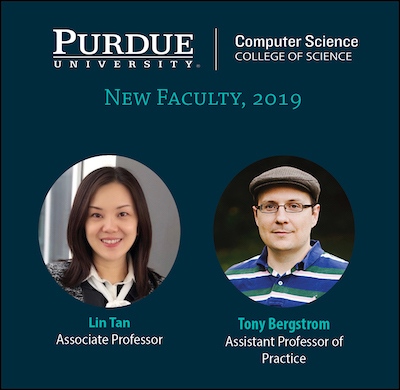 The Department of Computer Science is delighted to welcome two new faculty members, Lin Tan and Tony Bergstrom in the 2019 spring semester. The new faculty members join the department during a major hiring effort and expansion, as part of the Purdue Moves initiative. Lin Tan completed her PhD in computer science at the University of Illinois at Urbana-Champaign. Prior to joining Purdue, she was a Canada Research Chair and an associate professor at the University of Waterloo. Her research interests are centered around software engineering, software dependability, defect detection and repair, and software text analytics. One of her research focuses is on leveraging machine learning and natural language processing techniques to improve software dependability and using software engineering approaches to improve the dependability of machine learning software. Pedro Fonseca completed his PhD in computer science and engineering at the Max Planck Institute for Software Systems in Saarbrücken, Germany. Before joining Purdue, he was a postdoctoral researcher at the Paul G. Allen School of Computer Science and Engineering of the University of Washington in Seattle.His research focuses on building systems that are both reliable and secure. He has developed techniques and methodologies that are particularly suited to address this problem in the context of core software which other software layers critically rely upon, such as: operating systems, hypervisors, and distributed systems. He approaches this research by gathering insights on emerging trends, building systematic testing tools, and designing and redesigning software systems. Yexiang Xue received his PhD in computer science from Cornell University. His research focuses on developing intelligent systems that integrate decision-making with machine learning and probabilistic reasoning in uncertain real-world applications. His interests are in resolving key problems across multiple scientific domains, ranging from: artificial intelligence, machine learning, renewable energy, materials science, crowdsourcing, urban computing, ecology, and behavioral econometrics. He conducts research focused on developing cross-cutting computational methods, with an emphasis in the areas of computational sustainability and scientific discovery. Ming Yin completed her PhD in computer science at Harvard University. Her research interests are in the field of social computing and crowdsourcing where she designs realistic models, novel algorithms, and effective interfaces to facilitate the development of intelligent and sustainable systems. Her research connects the fields of artificial intelligence and applied machine learning, computational social science, human-computer interaction, and behavioral economics. She designs and conducts large-scale online behavioral experiments to obtain a quantitative perspective on participants' behavior in social computing and crowdsourcing systems.